As with most cities, gin is having a bit of a renaissance in Birmingham. As I came of age in the 90s, gin was wholly unfashionable – something your nan used to drink, or the bottle that would be left at the back of the spirits cupboard gathering dust. It didn’t help that it was traditionally paired simply with plain tonic, a truly boring mixer. But recently, the gin tide has turned and now you can’t turn around without falling over a specialist gin bar offering 6,000 different gins, or a pub which used to just stock Gordon’s but now has 74 different bottles crammed onto their shelves. But one Birmingham bar always knew that gin was fashionable. The Jekyll and Hyde, located on Steelhouse Lane just a five minutes walk from Snow Hill train and tram station, is part quirky whimsical boutique bar, part Victorian gin Parlour. 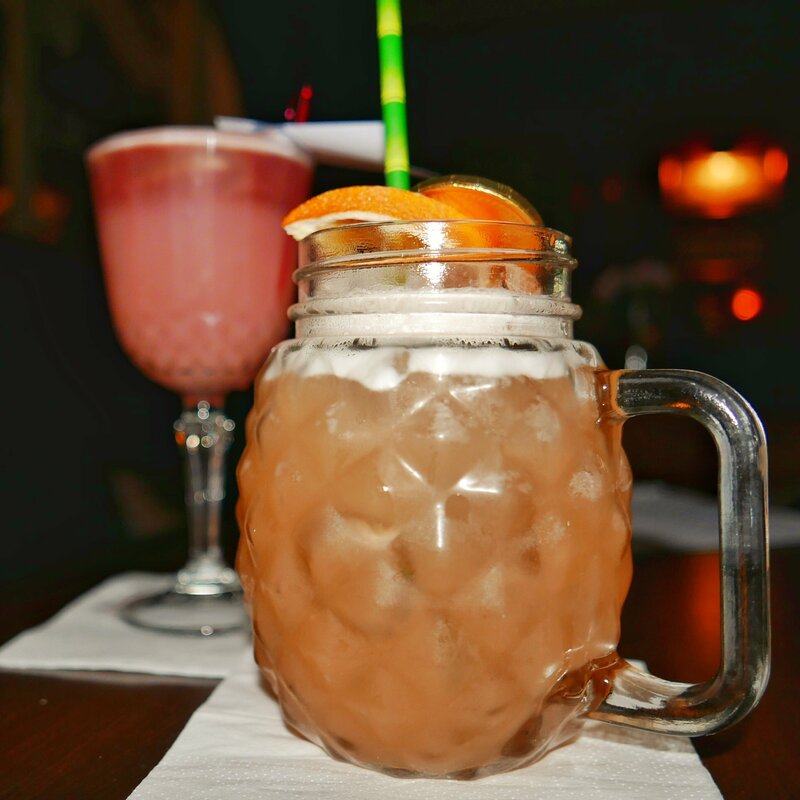 It’s run by Bitters ‘n Twisted who pride themselves on their individually themed venues, with a tiki bar, South American cuisine and good old fashioned pubs with a twist as part of their portfolio. I’ve popped into the Jekyll and Hyde previously, but as invited guests this was the first time I really got to sample what the renowned Dr Jekyll’s upstairs gin Parlour has to offer. As the autumnal weather truly strikes Birmingham, we wrap up well for the 15 minute walk across town. 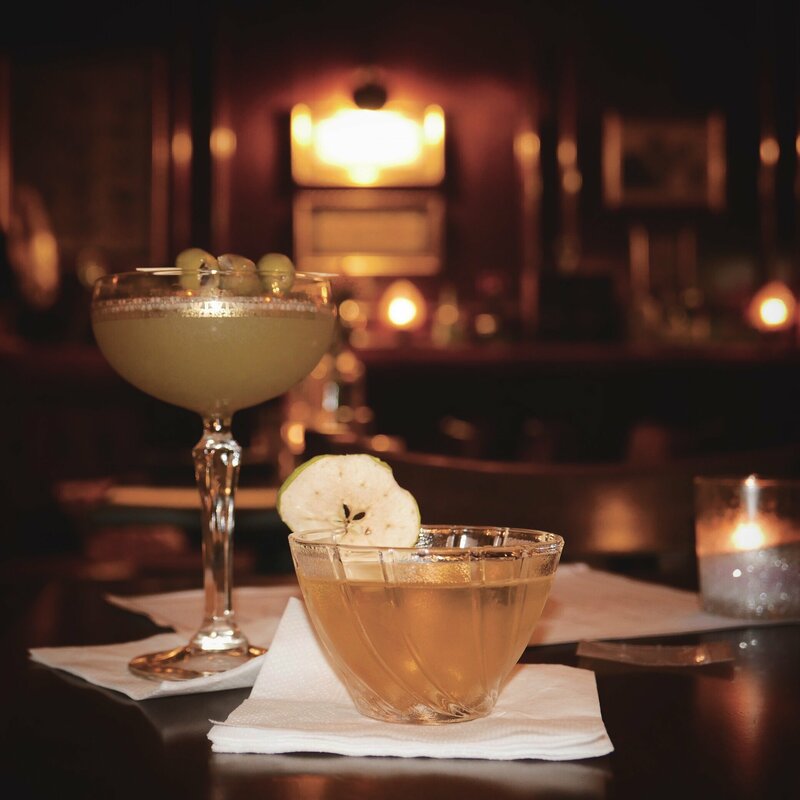 The Jekyll and Hyde is a short stroll from Colmore Row and is undoubtedly a little off the beaten path for shoppers being in the centre of the business district but it’s well worth seeking out. Mr Fletche and I are unfashionably early so we check out the newly sheltered Alice in Wonderland themed outdoor (now indoor) patio before we are invited to take our seats upstairs. The gin Parlour is all curios, artefacts, gin-bottles-as-ornaments, dark furniture, plush seating and low lighting. Hence the not-fabulous photos in this post (and that was despite having CPF Photography as my date). I’m so busy gushing over the decor that I haven’t even made my cocktail choice when our server for the evening comes to take our order. 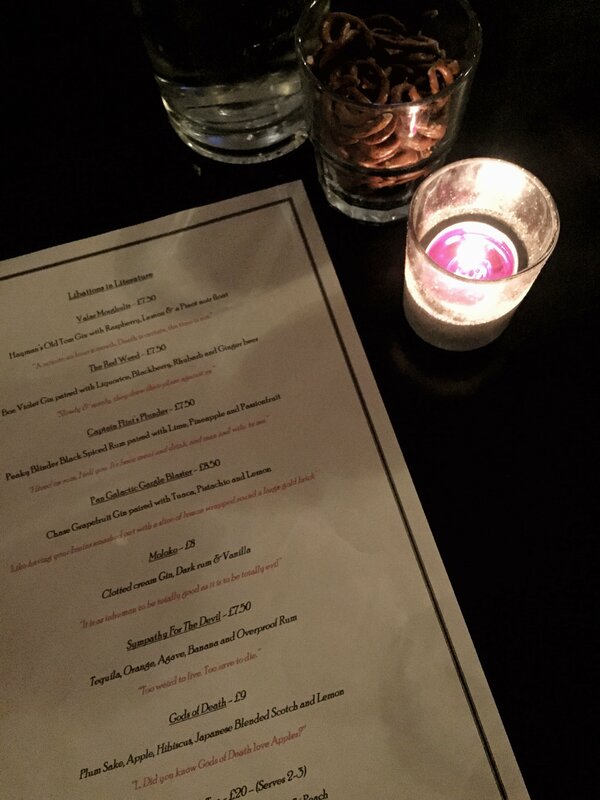 I concentrate on perusing the “Libations in Literature” menu, showcasing a selection from their autumn menu. War of the Worlds fan Mr Fletche is drawn to The Red Weed, a boe violet gin paired with liquorice, blackberry, rhubarb and ginger beer. I’m in a gin bar but plump for the tequila based Sympathy for the Devil (a nod to Hunter S Thomson’s “Fear and Loathing in Las Vegas”) served with agave, banana and overproofed rum. It’s served in a cactus shaped glass with added jelly beans. It’s nicely tart as expected with a tequila cocktail, but Mr Fletche wins this round with his liquorice laced concoction. I get extra points for the jelly beans though. We’re on to Round 2. The gentle soundtrack of soul, swing and the Shangri-Las is making me sway. Or maybe it’s the alcohol. This time we’re pulling out the big guns. Described in The Hitchhikers Guide to the Galaxy as “having your brains smashed in with a slice of lemon wrapped around a large gold brick” I opt for the Pan Galactic Gargle Blaster. Served in a martini glass, this chase grapefruit gin paired with tuaca, pistachio and lemon, accompanied by olives, smells and tastes divine. I win. Except Mr Fletche’s Gods of Death is also pretty awesome – this Ohba inspired cocktail consists of plum sake, apple, hibiscus, Japanese blended scotch and lemon. I still win, if only for the smell. If Jekyll and Hyde ever go into scented candles, this is where they should start. We’re invited to select our final cocktail of the evening. We have a wedding to sit through tomorrow and I’ve probably already had more alcohol than is recommended but hey weddings always have those boring standing aroundy bits where I can go for a quick snooze in a corner. I choose another gin-based cocktail – heeding the old “don’t mix your drinks” advice a little too late. It’s a Valar Morghulis for me (“All men must die” for those that don’t speak High Valyrian), Hayman’s Old Tom gin with raspberry, lemon and a Pinot Noir float. It’s a refreshing end to my choices. Mr Fletche has been eyeing up the Treasure Island themed Captain Flint’s Plunder so finishes up with this tropical spiced rum, lime, pineapple and passion fruit combo. It’s topped with a chocolate coin which he consumes before I can claim my half. It’s time to say goodbye. We were very kindly invited to test out the menu by the Bitters n’ Twisted team but we make sure the two servers who have worked hard tonight at keeping us up to the eyeballs in alcohol are generously tipped. At between £7.50 and £9 the cocktails are priced similarly – if not a little less – than other local establishments, where there aren’t specialists on hand to talk all things gin. And if cocktails or gin aren’t your thing (why are we friends?) then Jekyll and Hyde also offers a seasonal wine list, craft ales and bottled beers alongside their spirits collection.